Craigie Aitchison was a visiting lecturer when I was at Chelsea School of Art. He was always very quiet, gentle and disarming. Like his paintings he gave a sense of being delicate but this belied a strength. Frequently he was accompanied by his Bedlington terrier and the most beautiful models. His work was clear, distinctive and poetic. Images courtesy of http://www.gimagine.com. Sadly there were no titles or details available! 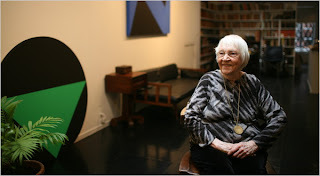 The Cuban-born artist Carmen Herrera in her Manhattan loft, surrounded by her art. After six decades of very private painting, she sold her first artwork five years ago at the age of 89. "Paintings speak for themselves," Ms. Herrera said. 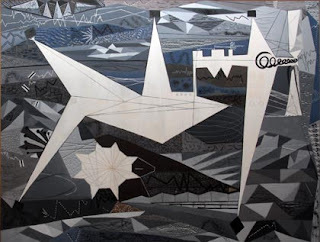 Geometry and color have been the head and the heart of her work, she added, describing a lifelong quest to pare down her paintings to their essence, like visual haiku. 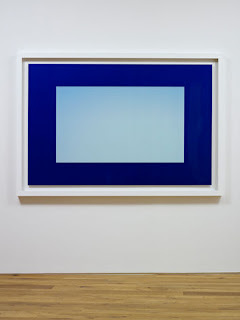 Shown here, "Blanco y Verde" (1966), a canvas of white interrupted by an inverted green triangle. the first practitioners of the art (and science) of photographic experiment in the 1830s and ‘40’s. year, under the collective title The Colours. works from Years One, and Two alongside the new large format images. Dark Intervals is a series of paintings exploring a new-found energy which embraces the combined elements of chance and deliberation, application and reverie. 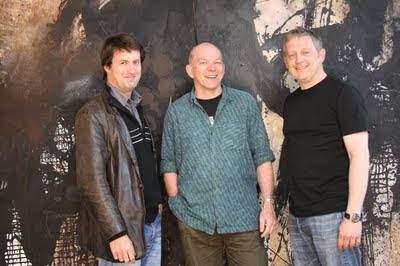 They are rooted in spontaneity and improvisation, akin to what John Cage described in music as ‘considered improvisation’. Nick Moore is a painter, musician and poet based in Bristol. He is a teacher and lecturer in both art and art history and has worked on graduate and post graduate levels. He is currently artist in residence at a GP Surgery in Gloucestershire as part of the Art Lift project. 'If anything in the world can teach a man to venture, it is the ethical, which teaches to venture everything for nothing, to risk everything, and also therefore to renounce the flattery of the world - historical... " Soren Kierkegaard. Venturesomeness is only one of the ethical values respected by modern painters. There are many others, integrity, sensuality, sensitivity, knowingness, passion, dedication, sincerity, and so on, which taken all together represent the ethical background of judgement in relation to any given work of modern art. Every aesthetic judgement of importance is ultimately ethical in background. It is its unawareness of this background that is an audience's chief problem. And one has to have an intimate acquaintance with the language of contemporary painting to be able to see the real beauty of it; to see the ethical background is even more difficult. It is a question of consciousness. ........Without ethical consciousness, a painter is only a decorator. Without ethical consciousness, the audience is only sensual, one of aesthetes. 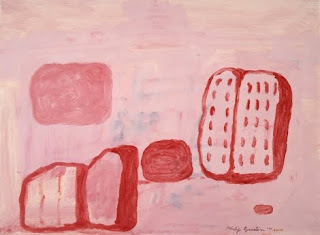 Timothy Taylor will be showing works on paper by Phillip Guston. and Rothko hits the stage at the Donmar in REd. 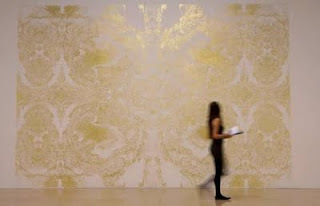 The painter Richard Wright, who creates ephemeral abstract paintings, drawings and designs wins the Turner Prize 2009 today. Is this ushering in a more subtle and deeper understanding of the role abstraction can play in contemporary art and culture? 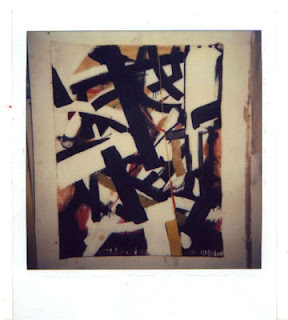 I thought you might be interested in these polaroids that I recently rediscovered. They are of paintings I made nearly 30 years ago whilst at Chelsea. Sadly I don't have better images of them and I don't have a record of the titles. "Why this solemnity about shapes and colours? Why this obsession with purity?" 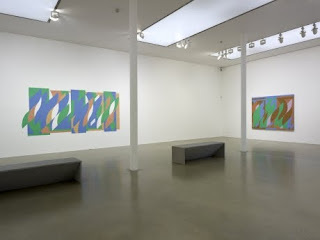 Bridget Riley’s new paintings are clean, bright, hopeful and full of movement. The simpler forms that Bridget Riley is drawing out and the push me pull you tradition in the images attract me but I still find the process and style to harsh and impersonal. 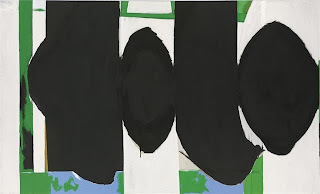 They are honed but not comparable to this Spanish Elegy by Robert Motherwell. 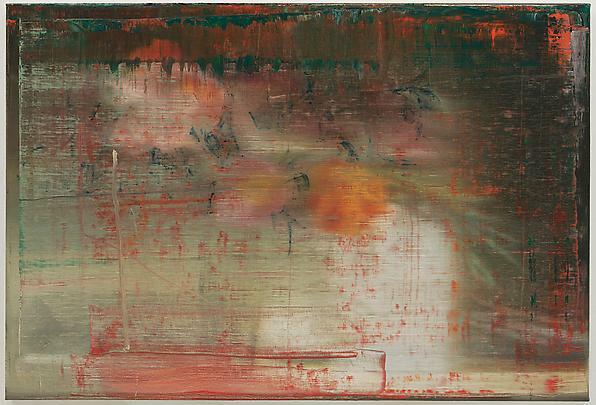 Richter is facing the Guston Dilemma. In thinking about the re-emergence of hard-edged abstraction Philip Guston's dilemmas and the sovereignty of the rational came to mind. 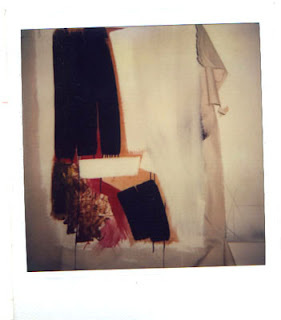 In response to Guston’s figuration the critic Rosenberg said “ the ‘scandal’ of the Marlborough exhibition is not that this leading abstract expressionist has introduced narration and social comment but that he has done his utmost to make problems of painting seem secondary.” “Painting needs to purge itself of all systems that place the so-called interests of art above the interests of the artist’s mind. 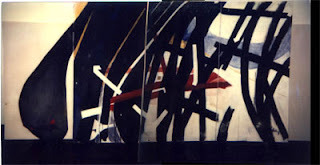 …it is time now to liberate it (abstract expressionism) from the ban on social consciousness.” Are we really there again? Or is the formality of reduction an appropriate response? Dore Ashton made the link between Guston’s comment and Goya’s dislike of artist’s that ‘aped’ nature without question. He then qualified the parallel drawn “ If you read “reason” as the governing power of skill, craft, memory, knowledge, there is no good painter without it.” This monkey business is rife. I have an aversion to art that pretends to be delivered through scientific analysis, which feels it cannot justify its activity and production unless it is validated by process established in science or fulfils some rational administrative brief. This is inclined to produce cool art and also produces monkeys responding to the peanuts dropped through the cage. Empirical data is not the same as knowledge. Intellectual ability is no guarantee of rational-thinking. Reductive rationalised art runs the risk of being dogmatic and purist, whether it is abstraction or figurative realism. Taking and defending a stylistic stance runs the risk of being habitual, repetitive and dull. Being random and not sustaining a focus runs the risk of unrealised ambitions. I am inspired when I can witness both the random and the rational in a work of art. This combination is rare more so in reductive thinking as the context increasingly narrows. Ref: Michael Bond New Scientist 31 October 2009. In his book On Creativity, the extraordinary David Bohm, expressed his desire for rational participation (This book provided me with the title and text for In Theory, Churchill House, Bath, 2001.) In seeking a solution to different realities he hopes for a common consciousness that withholds judgement thereby establishing a new intelligence. This poignantly would affect the relation between Newtonian and quantum models as well as abstraction and figuration, the inside and the out. A reservation on this vision is that surely judgement is required in all disciplines so at what point is it applied? And everyone “seeing the same thing” is not likely to be a creative scenario. God and Darwinists favour diversity and variation and are we not already very predictable. 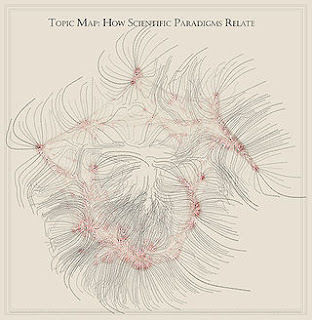 (New Scientist They Know What You’re Thinking 31 October 2009 & Horizon The Secret You Professor Marcus du Sautoy 23 October 2009) Having us all run through the same maze would make us more so. Perhaps I perceive the rational of these proposals as prescriptive when they are not. There is an ethical aspect to making art but there is no ultimate image or style, no final solution. If there were would we not have stopped at Giotto or Rembrandt? Participation and an holistic approach are ideals that have given rise to the good and bad. Rationality and logic has and can excuse the awful as well as the good. Perhaps there will be managed means by which we can all get stimuli that satisfy us. As long as there is a long enough gap between the repeat of the cycle that prevents us from being dulled to the stimuli then………………we can go on rediscovering America. Hahaha. The platform for Bohm’s vision is being established and the Open Source ideology is integral to operations and spreading. I am not certain where the freedom lies with it. It feels as if we are just staring at shadows. 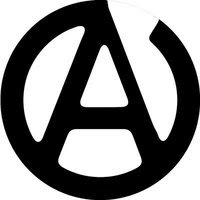 However the brilliant invention Autonomy struck me as being the closest to providing the most natural illusion of freedom and control in the experience and management of unstructured data. “More than 80% of all data in an enterprise is unstructured information. This encompasses telephone conversations, voicemails, emails, word documents, paper documents, images, web pages, video and hundreds of additional formats. Unfortunately, attempts to leverage this immense and strategic resource often fail because many businesses lack the requisite technology to understand and effectively utilize content that resides outside the scope of structured databases.” I approached Autonomy years ago in the hope of utilising their software to produce art. It seemed obvious to me that you could replace the word businesses for artists. No they are not one and the same. The theme for this year’s Ars Electronica festival was Human Nature. Here is a section from their festival description, The Reinvention of Nature. "We’re using innovative high-tech methods to observe the human brain while it thinks, so that we can now look behind the veil of our consciousness and see how our mechanisms of perception and decision-making capacities are reflected in our neurons. The long-established boundaries segregating nature and culture are breaking down, and we are once again confronted by the question of the essence of humanness and the nature of the human being." 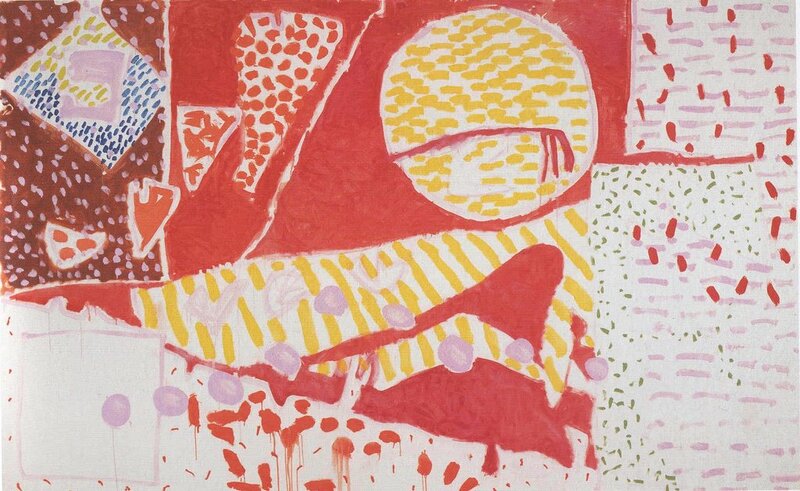 By way of a conclusion on this passage on abstraction, figuration, openness, participation, painting and digital developments: I have yet to feel “strange” (Guston) in response to digital technology in the way that I do in front of a painting. Paul Granjon in his performances highlights the fallibility of this relationship with technology for me, slightly absurd and disconcerting but not strange. Part of the discomfort is the imposition of engagement and the motivations that are driving its implementation. The strangeness of painting hits at the core. Our relationship with it is not anachronistic but essential. Ooooh aah ahh ahh ooh ooh - Monkey chatter. 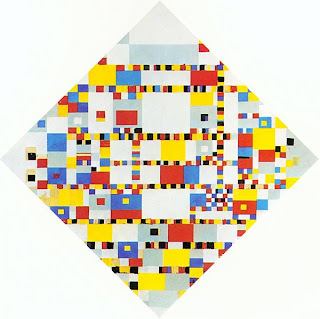 And while looking for texts regarding Mondrian's search for uncomplicated harmony I discovered the news on this blog http://thelowcountriesblog.onserfdeel.be/that there is a Van Doesburg exhibition at Stedelijk Museum De Lakenhal in Leiden. There is so much to approve of and admire in this search for simple harmony, which is much needed in these complicated times and for me more welcome than the other popular escape of the fantastical and gothic which appears currently all pervasive. The courage, scrutiny and genius of Mondrian will always remain a source of inspiration but surely this, a late work, is not a simple painting. Neither is it cold, vacant or clinical. The touch is visible and vital. 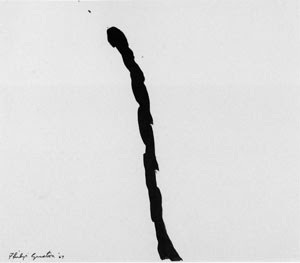 Vacant space and hard edge maybe clearing out the clutter but I seek to keep the emotional in my work and very often emotion is complicated, soft and crowded - Rothko, Motherwell. Grayson Perry in his excellent Unpopular Culture presents a simplicity that is not reduced and is emotional, political, visual and personal. As an exhibition it is sentimental but the works are not. Having just posted the piece below I went on to read the review of the Bauhaus exhibition at MOMA in New York. I was interested to see this endorsement and push of the constructivist aesthetic by MOMA. www.moma.org. I wasn't aware that the modernist attitude was being supported by the major institutions. Naiveté...moi? Here is a sample of the review "Finding a Bit of Animal House" by NICOLAI OUROUSSOFF in the New York Times posted today. "A big surprise is how much of the school’s mission still feels relevant, from the effort to come to terms with mind-bending technological advances to the desire to serve an audience beyond the usual cultural elites. It’s true this mission was pursued with an optimism that would be hard to conjure today, but if the show has a message, it’s that a little naiveté can be productive." 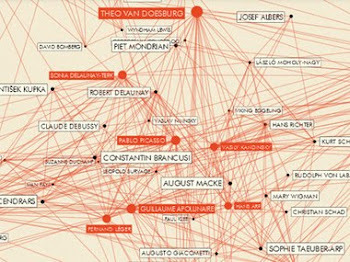 There is a very active abstract movement in America that is establishing links with like-minded groups around the world. Reductionism seems to be predominant and appeals because of a clean modernist, fabricated look. Its construction and design imparts a futuristic feel and implies a rigour of analysis, a honed decision making. For me the reductionist methodology is floored as a means of analysis whether it is within science, architecture or painting. It denies, excludes and is inclined to become fundamental, dogmatic and regulatory. (One commentator in the US has declared that abstraction is non political and a great investment, therefore an ideal vehicle for sponsorship and patronage in this troubled world. History repeating itself...I digress) Science has recognised that reductionist enquiries need to be tested against other disciplines to stand up. Newton/Quantum/Body/Mind/Classical/Contemporary. In doing so the premises on which the isolated reductive thinking has been based, at worst is undermined and at best is shown not to be compatible with other paradigms, theories, experiments or realities. Having stated this I greatly appreciate and admire the focus that, for example Minus space is providing. They are encouraging debate and are providing a focus for some beautiful work. It follows an American tradition yet is fresh. For me the majority of the work that I have seen under their umbrella goes part of the way to answering some of the quests in my work. This contemporary movement doesn't reveal the human flaws and vulnerability that I recognise in their predecessors that I have been so inspired by - Guston, Motherwell, De Kooning, Newman etc. The clinical aesthetic strikes me as one of wishful thinking and hiding behind mechanism. Painting as a process has the uncanny habit of revealing more than is perceived by the maker. Design tends to be outcome led and a pre-emptive filter. It reveals a lot but less of the unguarded. The reductive is good at finding motif, which is a mountainous task, but in my experience the significance and flavour is then lacking. To combine the two processes is surely the pinnacle. Labels: abstract artists, Lyle Rexler, minuspace, reductionist. Painting. 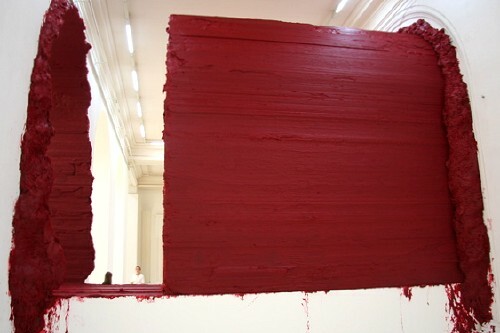 What is it about the act of painting that is so captivating? The process of painting, the creative act of placing pigment on canvas is an extraordinary experience.. I am thinking beyond any romantic ideas about the smell of linseed oil or turpentine in the studio or the image of the artist out on some kind of action-painting bender; drunk on the stuff in a Pollock-like fury. I am interested in paintings and not pictures. Paintings that require some thought beyond a merely visual reading of the subject matter. Perhaps, I am thinking about the 'letting go', that is required from us as a ‘viewer’ to go beyond just looking. For me painting and especially abstraction, is an activity that coalesces the engagement between thought, material and action. A process that responds to the 'feel' of the painting. There is something of the epic, of Renaissance heroicism, in the large painterly canvases of Pollock, De Kooning, Rothko and Kline. The power these paintings reflect through there size is important to painting in the second half of the twentieth century. We read these paintings through the physiological effect that they exhude. This can only be received when standing in front of one of them, yet we know them best through tiny images in books. 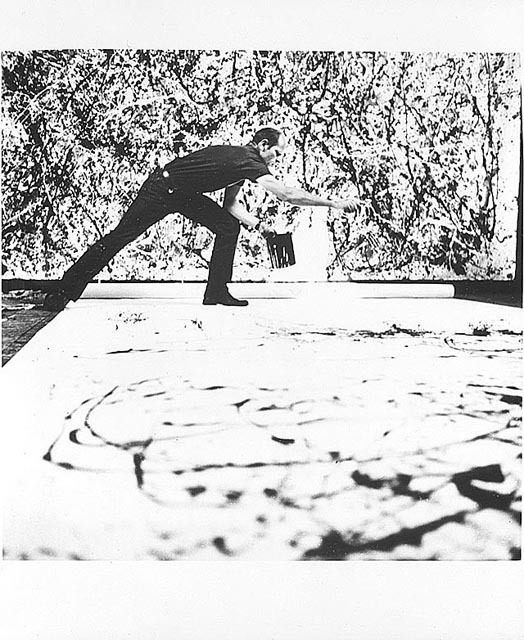 When was the last time you stood infront of a Pollock? 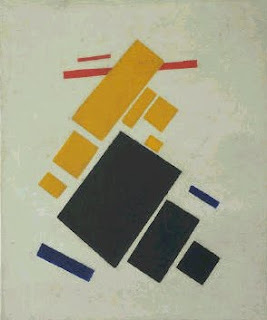 There is an energy in the use of the large expanse of space that these painters brought to modern art, through the interaction of colours, the shapes or gestures that remain on the picture plane. In this age of instant gratification, perhaps something is being missed here when not standing in front of a real painting. We can learn a lot from looking at developments taking place little over a hundred years ago by Monet. A debt of gratitude that the art historian Jed Pearl in his article, 'After Monet', Modern Painters, Spring 1993. He suggested many artists have followed in the direction of Monet, perhaps indirectly, and with specific interest in the late and large series of paintings entitled 'Water Lilies’. These are now in the Musee de' l'Orangerie, Paris, at MOMA, New York and London's Tate Modern, to name a few. Claude Monet. Water Lilies. c.1920. This is often where there is a concern with the modern artist and his/her choice in subject matter. Good painting doesn’t need subject matter. How important is it that something is from reality or non figurative? The interest for me, lies in what response we receive from the painting, for instance, as a subject matter how interesting are water lilies on the surface of a pond? Is it the way the water lilies are painted that we pick up on or is it the transference of the water lilies into paint onto the surface of the canvas that we some how receive visually? In this way good painting transmits a signal that requires more than just an intellectual response, surely it triggers your visual experience, and that subsequently triggers your emotional response, just like music can. 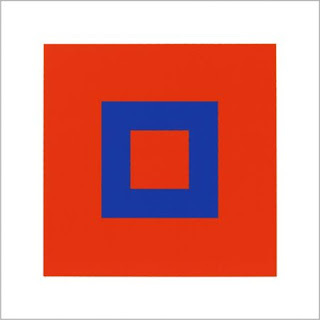 When visiting the San Francisco Museum of Modern Art as a student, I stood in a large room of Clifford Still paintings, they were the large, black, red, yellow and brown paintings from the late fifties, they opened up the room in terms of colour and space, they jumped back and forth, what Hans Hofmann called the ‘push and pull’ of the picture plane. These paintings came alive in a way that was not just visual, especially those jagged fault lines of Stills; compressed next to each other like the surface of a cliff (no pun intended). It was a defining moment for me; I then went around the museum, looking at the paintings through this understanding of a perceived depth, trying to decipher the paintings through this 'visual experince' which could actually be called 'sensation'. 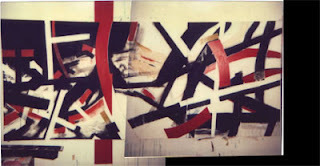 The funny thing was, I was not even fond of Still’s work, but the concept of painting in that way, in that size, worked, it could equally have been Pollock, Rothko or Kline, or any of the others come to think of it..
At a certain moment the canvas began to appear to one American after another as an arena in which to act...What was to go on the canvas was not a picture but an event. 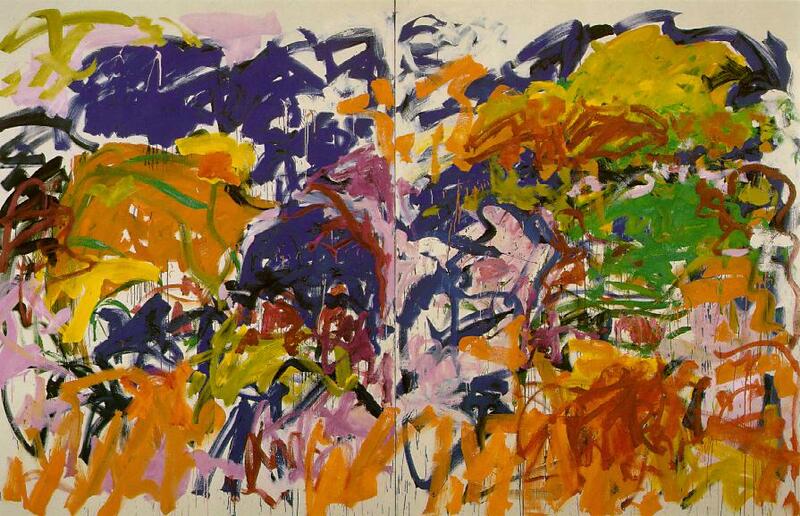 Few artists seem to communicate in this strange energised frequency that Twombly maintains, yet Joan Mitchell comes close. 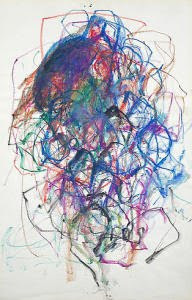 For these artists abstraction is not just somewhere to explore and experiment with gestures, marks and forms. Nor is it a safe platform for visual communication, good abstraction, occupies an arena that is constantly moving, vibrating with energy and restlessness. It should draw in some other element; an unexpected spontaneous response through marks, a deliberate choice of colour that creates an awkwardness to the painting etc, to ensure that it does'nt fall into an all too easy parody of beauty. A number of works stand out as powerful evocations of this ‘arena’. 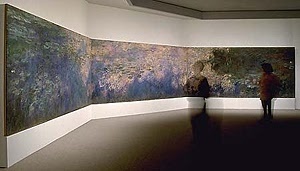 The large triptych at the Whitney Museum entitled Clearing by Mitchell, is one of them, with its large echoing black lozenge shapes and mauve ringed areas, and a later one ‘Untitled’ a diptych from 1992, that hovers in the centre of the paintings like the boughs of two trees in a Japanese garden. This painting can be traced back to Monet and his energised responses to the water lilies at his house in Giverny, France, towards the end of his life. Even if Mitchell is unaware of it, the influence is there. Monet’s paintings were shown later in New York after World War II, and bought by MOMA, seemed to have meant more to Abstract Expressionists, than any other artists in Europe at the time, except perhaps the artist Patrick Heron, who followed the modernist cause from Monet through Bonnard and Cezanne to Matisse and Braque, but didn’t expand his paintings on the scale of the American painters, until the sixties and seventies, but I'll be discussing him later. Where else can we see the influence of Monet? At the Whitney retrospective exhibition of Mitchell’s work, an essay in the catalogue brings forward the significance of the series of paintings, twenty-one in total painted in 1983–84 called 'La Grande Vallée'. Their is an essay by Whitney curator Yvette Y. Lee devoted to the series. Unfortunately, only three of the paintings are in the show, which makes it impossible to assess the impact of a body of work ideally seen as an environment. These lush, abundant paintings are landscape impressions, predominantly floral in feeling. They clearly echo Monet's 'Water Lilies' and other garden subjects like 'The Japanese Footbridge', and the 'Grande Vallée' cycle is deeply indebted to the Impressionist master, never mind the repeated denials by the catalogue authors. 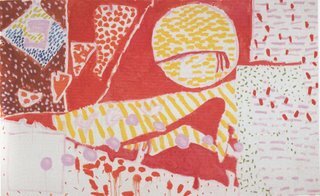 Her paintings are about the very materiality of paint; slashing strokes, colour over colour and scratchy, tangled lines characterize these early works from the fifties. 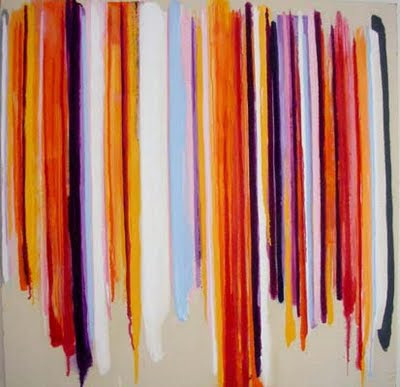 Nearly all her paintings use nearly all her colours and all her marks in some combination; the paintings are almost always all-over mat in finish (glazed bits appear only occasionally). A painting like 'Low Water', 1969, is absolutely classic Mitchell, combining all of the above in hieratic descent. Mitchell first visited Paris in 1948 and was to stay there from 1955 until she died in 1992. During this time she met the Canadian-born French artist Jean-Paul Riopelle; they remained close for the next 25 years, lived together from at least 1960 to 1979. There was a close dialogue between his Surrealist-influenced "action" painting and her own Abstract Expressionist oeuvre. 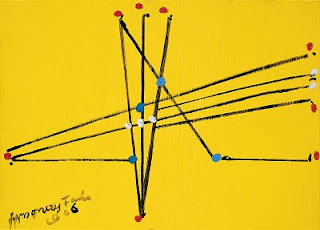 There are also in Mitchell's art the impact of contemporaries like the German abstract painter and theorist E.W. Nay, who developed the theory that "to paint is to form the picture from colour." A similar approach adopted by Patrick Heron at around the same, this is discussed later in this essay. 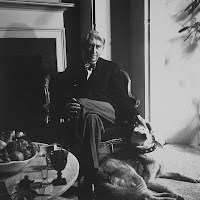 Mitchell lived on the banks of the Seine at Vétheuil from 1967. Paris was only thirty-five miles away; here was the cannon of European modern art, the Courbet and the Impressionists at the Museum D’Orsay and Monet’s ‘Water lilies’ at the Orangerie. 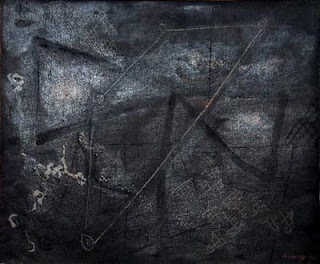 As for contemporary artists of the time, she presumably had the opportunity to consider the work of Europeans of shared sensibility, artists like Mathieu, Soulages, de Staël, Vedova, and even Alechinsky and Jorn of the CoBrA group who would have often exhibited in Paris. The CoBrA artists believed in spontaneous painting, what one writer described as "pure psychic improvisation," this view was shared by Mitchell, who said she never planned her paintings, never thought about them, never did preliminary sketches or laid down any "starter" outlines on the canvas. She insisted she just painted what she felt. 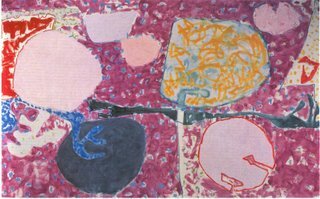 Another artist who took the large scale painting from Monet was Patrick Heron. 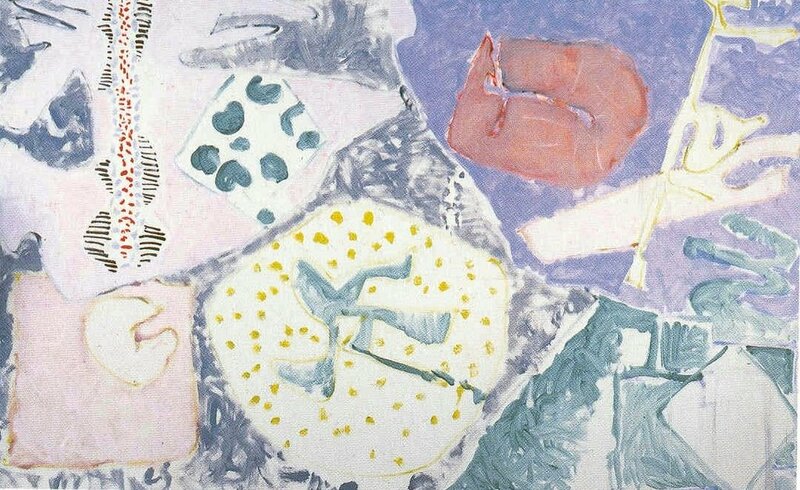 Consider, the late Heron paintings from the eighties, that he called ‘Garden’ paintings. They retain a freshness and vibrancy still. when looking at these paintings are we meant to perceive these forms squeezed straight out of the tube across the canvas or the blobs of pigment as specific native flowers from Australia, where many of the paintings were made? Or like the Clifford Still paintings do they respond physiologically? Again that feeling of space is present, of a space made from colour. Heron did suggest that the time has come to give up 'to truly sensational painting.’ Here he is not copying nature but evoking it. 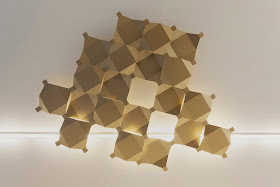 ..a process of continuous apprehension that moves across the surface, from left to right and back again as the eye is enhanced by the flicker of light, and then caught by the space of the experienced world, and the eye seems to glide into an indeterminate distance, potentially infinite. But as Gooding continued to discuss, there are obvious differences, Monet, being a nineteenth century painter, is interested in the ‘descriptive’ qualities of paint and Heron, being a late twentieth century painter who’s raison d’etre is ‘paint as colour, colour as paint’. But again we have this interest in the ‘visceral’ qualities of paint, where the transformation from an observed and lived experience like Monet to the more ‘sensed’, in Herons words, to ‘translate sensation into terms of aesthetic emotion’. 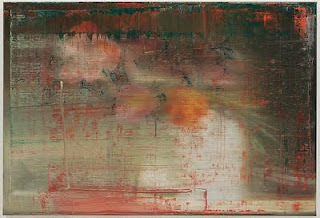 What is interesting is considering Heron in the same light as Twombly and Mitchell as a lyrical abstraction painter. I believe we have a series of paintings that emerged in the early eighties from Heron’s Porthmoer studio in St.Ives, Cornwall that will be seen as a highly significant body of work, that should be considered with Twombly and Mitchell's oeuvre. Alongside Big Purple Garden Painting: July 1983-June 1984, there is Red Garden Painting: June 3-5 1985, White Garden Painting: May 25-June 12, and Pale Garden Painting: July-August 1984. To me these are the embodiment of what painting is about, they sit individually as explorations of paint on a surface tracing the artists movements in front of the canvas, transformed to spontaneous actions on its surface. These evocations could refer to a real landscape but this never really emerges, they exist as an alternative landscape transformed through ‘sensation’. 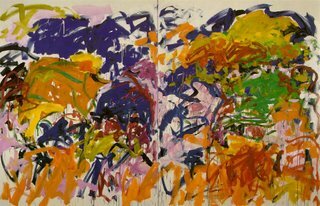 Joan Mitchell, Cy Twombly and Patrick Heron are still painters that retain a fragility, a concentrated energy in their work, a possibility of what painting can achieve. 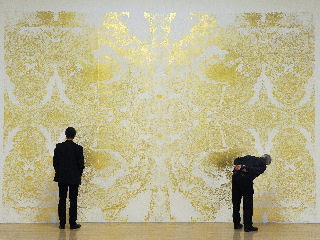 They have 'enchanted' the physical act of painting, the simple material of pigment on canvas and brought them to life. A painting by David Moxon from his recent exhibition at Chapel Row Gallery.